A bloody deadly battlefield for these horses every time they go out. But, this is not World War 1 in 1916 – this is horse killing for $2 bets and sadistic human entertainment in the year 2016. Utterly unacceptable in a civilised society. Thanks Carolyn – DITTO from me. My heart, and thoughts go out to all the racehorses who DIED this weekend for this cruelty circus, and death camp. To all you who participate (Owners, Trainers, stable personnel) and/or support (people who bet, pro-horsing publications) may you one day poses just one ounce of compassion for these racehorses as they endure cruelty. Abuse, pain, suffering, and even DEATH to fatten your wallets, and/or egos. After all the facts, after everything that is known you STILL remain silent allowing more to DIE! To those who have the audacity to come on this Blog, and actually DEFEND this blatant horse killing to the point of DEATH – ya’ll need your head examined because you have no heart. Overwhelmed with this beautiful piece of writing. Thank you, Carol Mcglone. Thank u for your kind words. I wish I could do more to help end this horror. Feel free to pass around, perhaps it will move hearts and minds. I’m not well to do, and not politically connected, I guess all I really have that might help are words. 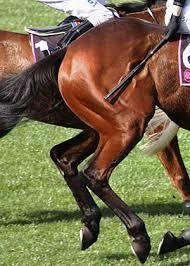 I’ve never even had a horse, but, I know in my heart of hearts this is a vile sport that needs to end. On July 31, 2016, there was another racehorse vanned off that didn’t make this list – his name, Whistle Included. From Equibase; “WHISTLE INCLUDED off slowly lagged through the turn, came nine wide in upper stretch posing no menace, vanned off after the race”. This was a 5K claiming race at Mountaineer, his trainer was Walter Bish, owner was Karla Taubert-Diaz. The 7-year-old bay gelding has not run since. So let’s recap – Whistle Included, a 7-year-old gelding, last ran at Mountaineer on July 31 for Bish and Taubert-Diaz in a 5K claiming race. Vanned off after the race. Found at auction not even 3 months later, already in the possession of a kill buyer. He has been purchased (without his former owners’ help) and has been transported to a veterinary clinic. At the vet clinic with a big, ugly ankle and he’s one of the lucky ones. Nauseating. Thank you, Joy for exposing this story. A despicable, callous, heartless act! What did this horse do to deserve this? Absolutely innocent – incapable of doing wrong, unlike his abusers the horseracing industry which mistreats and kills horse’s every day of the week. As we know, Whistle Included is just one example only, one hates to think of all the others out there like him. His HUGE ankle is a worry. That’s right, Carolyn…we know situations like this sweet gelding’s are not isolated incidents. Whistle Included raced for Vinery Stables and Steve Asmussen, winning his first time out at Churchill as a 2-year-old. In his 8th start for Vinery and Asmussen, they unloaded the gelding for $7500 in a claiming race. In 2013, he was raced 15 times in less than 12 months – at least once with only a week between races. In all, he made nearly 129K in 46 starts. One-hundred and twenty-nine thousand dollars – and not a penny of his own. But that’s horse racing. Joy, as you mentioned Vinery, I’d like to take the opportunity of telling my experience at a Vinery stud. In the breeding barn, mare with a very young foal at foot is brought in to be serviced by a top sire. Foal taken away distressed with the separation from mother, constantly crying out. Mare’s ears are back frightened and calling out to her baby. Handlers restrain her by tying ropes around her feet to prevent her being able to take even one step. The often forgotten abused teaser pony plays his role and then the stallion is brought in but reluctant to serve her. Exhausted from his serving duties. Baby foal still screaming out, mare is in a state of visible distress and fear. This brutal process made me feel so sick in the stomach I thought I was going to vomit. Then went to the stud’s equine vet hospital where I saw a few newly born foals in intensive care, tubes everywhere with their worried mothers nearby. A mare who had recently foaled was in a bad way and they were trying to save her only because she was very valuable. No doubt insurance was a factor with these valuable foals and mare. As I was leaving saw a young girl sobbing her heart out leading a mare out of the breeding barn, the mare could hardly walk. And of course this is what goes on in all the other studs. Business as usual in the horseracing industry. Thank you, Joy for telling the story of Whistle Included. Anyone who supports this horrific horse abusing business, in anyway, is complicit in this sad story and so many countless others. Every horse has a story and very, very few have a “storybook” ending..
And I guess this is the same Kelly Smith that was highly criticized by some people that can only be described as “pulling with the hare and running with the hare”. I would like to ask the critics where they were when Whistle Included was waiting for help as he was purchased by the kill buyer ? Yes, Rose…the same Kelly that rescued Financial Mogul and countless others. Rose, Whistle Included was euthanized yesterday due to the severity of his injuries incurred at the hands of those who owned and raced him. Joy and I saw the x-ray of the ankle and it was ugly…very ugly. His left front was shattered. Whistle was allowed to suffer for well over two months (he last raced at Mountaineer at the end of July) during which time he was passed around a couple of times and then, ultimately, dumped with Bruce Rotz, a contract kill buyer. If not for Kelly Smith, Whistle would have been on a truck to the plant. How could anyone argue with slaughter versus humane euthanasia? I’m now going to digress a bit. Kelly Smith has been bashed and trashed, unmercifully, by many racing supporters and they know exactly who they are. Now, I believe it is always better to try to get a horse BEFORE it gets with the contract kill buyer or the kill buyer middleman, but sometimes that isn’t possible. Anyone with minimal intelligence should be able to comprehend that. I have never put a dime into Rotz’s pocket but I have donated twice this year to New Bolton to help with Kelly’s vet expenses. On Thursday, I reached out to one of my contacts, who is immersed in racing, and asked her to provide me with Steve ASSmussen’s email since ASSmussen trained this horse earlier in the horse’s career and I’m sure that ASSmussen would be happy to help a horse that HE made money on by donating to New Bolton. Not surprisingly, I haven’t yet heard back. Finally, some racing apologists feel that there is a “proper” or “correct” way to rescue. Of course, that is nonsense but that is what the apologists want you to believe. There are many different ways to save a horse just as there are many different ways to negotiate a deal. None of them are successful 100% of the time. We must always try to put our personal opinions to the side and work to save the life of a horse, or, at least, offer that horse a humane death. Where were the “critics” you ask? They were nowhere to be found, Rose, and that is usually the case. I now think it is time to write a Shedrow Secrets story about Whistle Included. It is a disgrace to society what goes on in this business. That poor horse had to be in a lot of pain and was about to endure the ultimate betrayal– a long and inhumane journey to a terrifying death in a slaughterhouse while all his connections turned their backs on him and got on with their dehumanizing “work” with others of his kind. PS What would surprise me, Mary, is that you did hear from that horse abuser, Asmussen and that he had parted with a few dollars from the dollars he made on Whistle Included ! Thanks to everyone here who looks out for these silent forgotten profit slaves for this despicable business. I use to haul mares during the breeding season in my private custom horse trailer that converted to a large box stall when the divider was removed. I did it on a small scale for one breeding season only. Anyways, I got a call to pick-up a mare and foal to bring the mare to Vinery to be serviced by a top stallion. I looked up the mares name and she was a multiple graded stakes winner back in 1995 so she would have been 20 years old in 2006. I thought there’s no way this is the same mare, but when I arrived to pick her up it was indeed the same mare. The wear and tear of being a top racehorse coupled with repeated impregnation and foaling (she had foaled no less that 12 foals) had taken its toll. She had vision problems (blind in one eye due to old age, pre-existing racing injuries etc) and had almost died foaling last time I was told. However, that still wasn’t enough for her to get a decent retirement. Anyways, she was so smart that she knew the van meant another breeding and she made it clear that she didn’t want to load. She was sore and limping. I refused to take her, but somebody else did. I later spoke with her and she described a horrific scenario of not only separation, but she couldn’t handle the weight of the Stallion and down she went splayed on the ground. She was knocked out for a short period of time. After they got her up, she was disorientated, but they capitalized on that to restrain her. That still wasn’t enough for these callous cold-blooded horse racing people so they forced her back up with a twitch and a beating to make sure the sperm was in. Her foal sensed that her Mother was not well and shrieked the entire time. I ended my trailer service and so did the other girl after that experience, but this goes on more often than not I’m told by people who have worked the breeding shed. Many go from liking this business to hating it, and said when somebody witnesses that and continues upholding this business then they are cold-hearted slime bags – I agree. Incidentally, the mare died giving birth to her last foal – the result of this breeding session. After runnnng her heart out, making lots of money, and being abused as a breeding machine she never got a true retirement. Her scenario is not unlike dairy cows when you really think about it. This business is slime at the bottom of the barrel with the supporters inside the barrel . TY Gina, for recounting your horrific experiences – they must be terribly difficult for you to re-live when telling us about them. I’ve discussed the plight of broodmares with other racehorse supporters and all agree – we feel the greatest sorrow for those exploited mares as they have literally had EVERYTHING taken from them. That being said, I’ll soon have a story with a good ending for one of these wonderful creatures – race mare to broodmare to secure, safe and loving retirement. Joy, I look forward to hearing the mare’s story. I do feel a great sadness for the life of abuse these mares endure. And we know most are sent to slaughter when they are not successful and when they are barren. My 17 yr. old mare, a former racer and brood mare, is a sweetheart. She is smart too. She has learned to work the latch on her stall door to the pasture and turn herself out if I’m not there to feed by 7 am. Of course she comes back into her stall the minute she sees me. I feel blessed to have her here with me and know she is safe. Incidently., she was foaled May 6, 1999 in Kentucky and she had her first start at Keeneland on 11 April 2001. As you can see, she was not even 2 years old. Oh Rose…what a lucky gal your mare is to have you! Truly, my eyes well up with tears when I read your words – full of love and pride in your mare – because I am fully aware of the fate of SO many others and realize your sweet, smart girl could have easily been one whose final trip was to the slaughterhouse. Instead, she lives a life being cherished and having nothing expected of her. Thinking about her, my own and those my friends have rescued from this abusive industry brings a range of emotions to the surface…intense sorrow for the many that never got the chance to be loved and incredible gratitude to those like yourself who open their hearts and homes to the most wonderful creature – the discarded racehorse.